Universal cable tester with 512 test pins. 512 Point Universal Cable/Harness Tester. 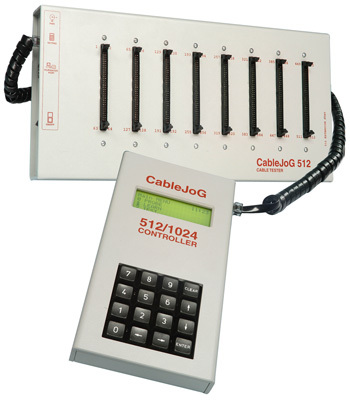 CableJoG 512 provides a flexible testing system to suit individual customer requirements. Call up one of thirty previously stored cable connection details. Transfer details in compare memory to one of thirty locations in the database memory. Either ON-LINE for continuous result logging and label printing, Or OFF-LINE for when the unit is not connected to a printer. Send a cables details to the 'PC', for archiving or transferring to another unit. Connector pins 8 64 way via standard IDC header. Power External 'Plug Top' power supply. L 200mm W 430mm D 50mm.